The Manila Observatory participated in this year’s Talakayang Alay sa Bayan (TALAB) of the Ateneo de Manila University on 10 October 2018. Hosting a topic on climate justice, Dr. Gemma Narisma, Fr. 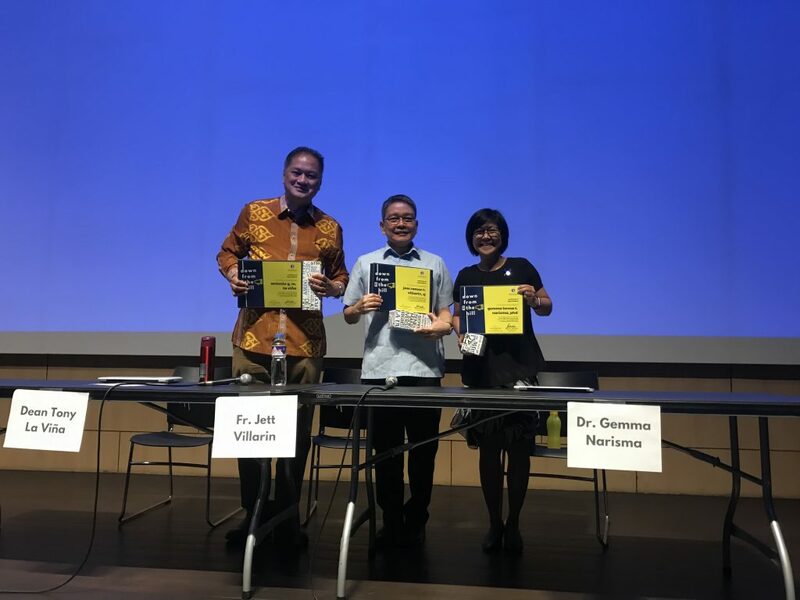 Jett Villarin, and Dr. Antonio La Viña all sat together to talk about climate change and associated physical hazards and how it affects the exposed population and the vulnerable who are more susceptible to the impacts of the climactic and extreme weather hazards the world is experiencing. The TALAB session was opened by a presentation of MO’s Executive Director, Dr. Gemma Narisma on the state of the climate, how a 1.5 degree increase in temperature can make the vulnerable even more vulnerable in the future. Climate Policy expert, Dr. Antonio La Viña discussed about the complexity of climate and environmental policy in today’s context, and that there is a need to push for a new framing to climate change that encompasses not just the environment but also poverty and human rights. The event was attended by more than 400 students and staff of ADMU, and the public at Leong Hall, ADMU.